Oh, before we do, some of you following along may have noticed I didn’t do #32, 100% Sourdough Rye and #33, the gigantic, 4 pound Poilâne-style Miche (pictured on the BBA cover). 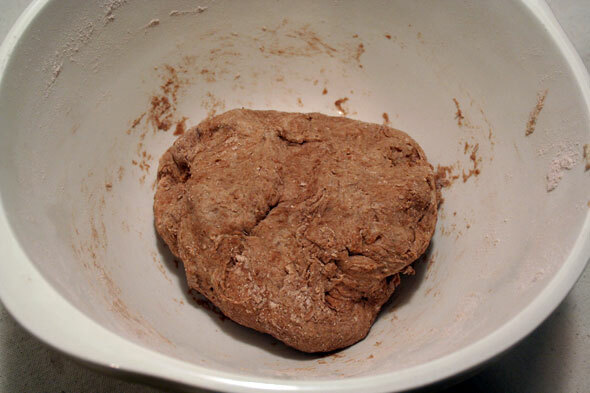 I’m going to skip the 100% Sourdough Rye because it’s needing main ingredients I can’t seem to get my hands on, specifically white rye flour and rye chops. I could do a substitution but then, it’s no longer the bread in question. If I can ever get some of these items, I’ll give it a whirl. Another reason I’m not jumping on it is that it’s been getting poor reviews by several other BBA Challengers. 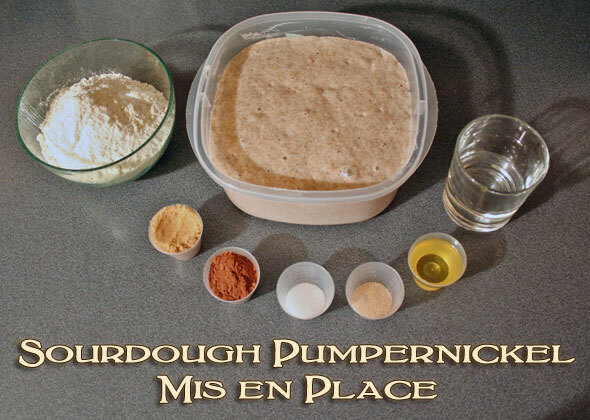 The Miche, on the other hand, I will try to get to, it’s just that I don’t have any Whole Wheat flour at this time so that’s on the shopping list. Instead of not baking this weekend, I chose to hop ahead one and hit the pumpernickel, one of my fave kinds of bread. I do hope it turns out well. 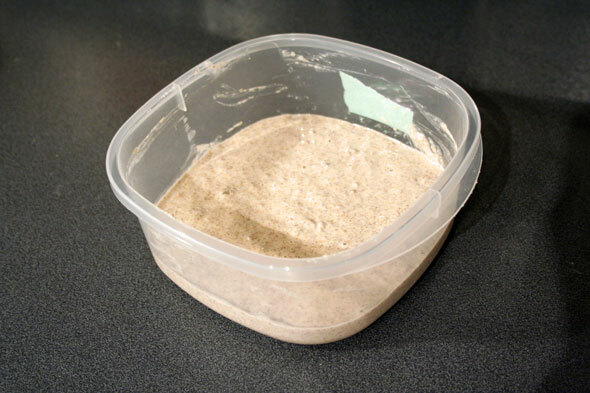 This is a two-day bread, the first day is simply setting up our stiff rye starter. 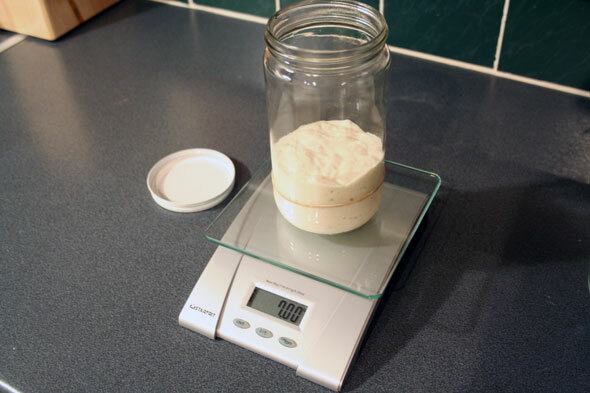 For that, I build up the standard white starter to 7 ounces. With this now active and bubbly, I fire up the rye starter which is the whites starter (or ‘barm’ as Reinhart calls it) mixed with 4.25 oz rye flour and 6 oz room temp water. 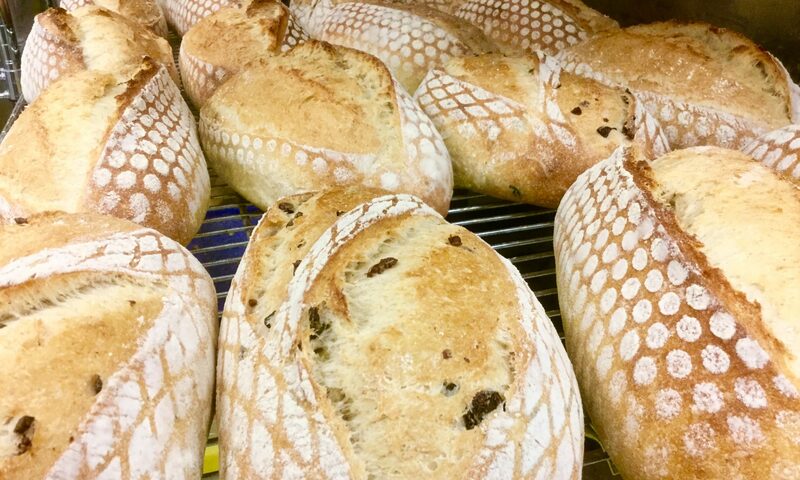 Mix, cover and let ferment for 4 to 5 hours for the flavours to develop and the sourdough yeasties to propagate throughout. 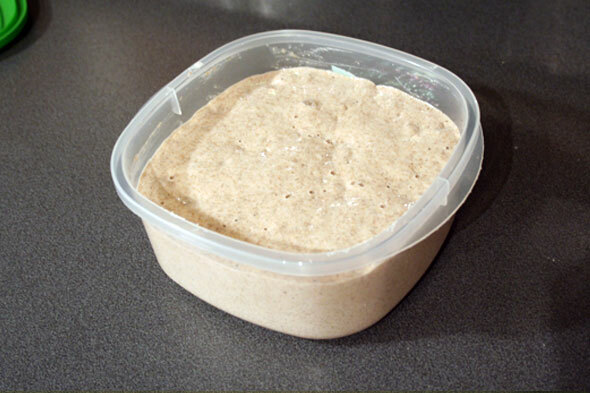 After this time, we have an active, bubbly wet starter , at about 130% hydration. 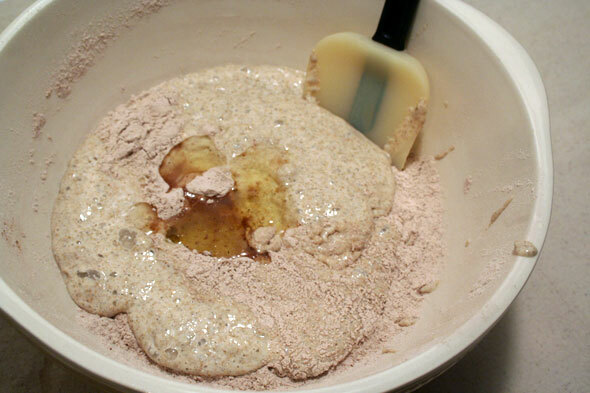 We’re now ready to go ahead with our Mis: Bread flour, the rye starter, 1/4 cup of water (if needed) then, from left, brown sugar, cocoa powder, salt, yeast and veg oil. Like I said, pretty simple stuff. Missing from the ingredient list here: bread crumbs. Although it’s noted as optional, the recipe asks for 4 oz of bread crumbs, preferably rye. Didn’t have any of any type so it became optionally skipped. Not sure what the purpose of adding bread crumbs would be either, it’s not noted anywhere in the recipe. 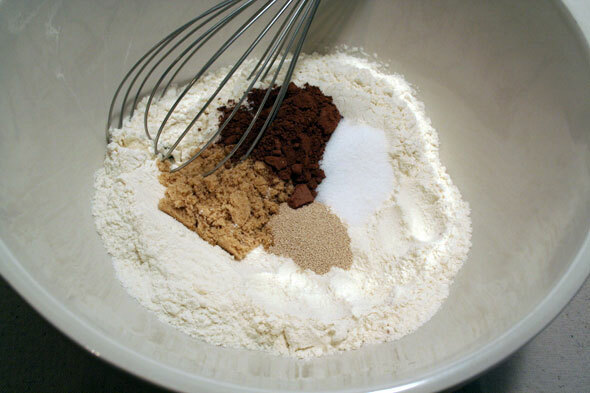 Next are the typical steps: stir together your dry ingredients, add the liquid ingredients and mix until a rough ball forms. 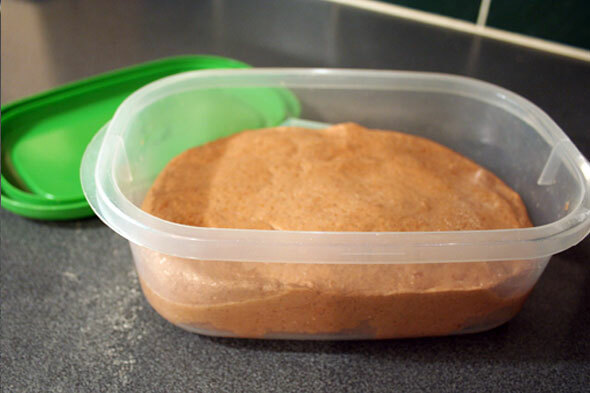 One thing to note here; sift that cocoa powder before adding it as cocoa tends to clump up. I had to scoop it out thewhole bowl of dry ingredients after taking that shot and sift it because there were a lot of small black cocoa nuggets that were just not breaking apart simply by whisking. You’ll likely notice a lack of KitchenAid Mixer here. I decided to do this one manually. No real reason, other than just to do so. Turned out to be quite an easy bread to mix. 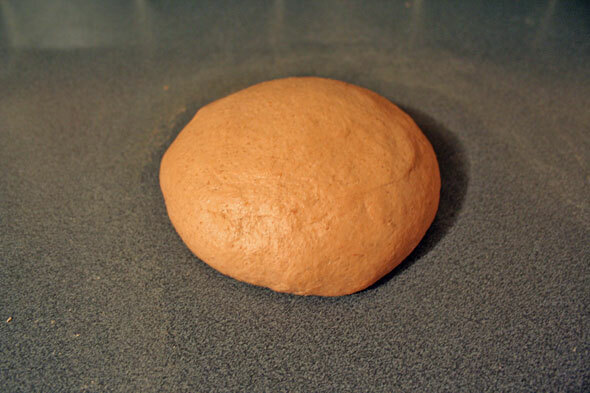 I turned the dough ball out onto a very lightly floured counter and began to knead. This took about 6 minutes. 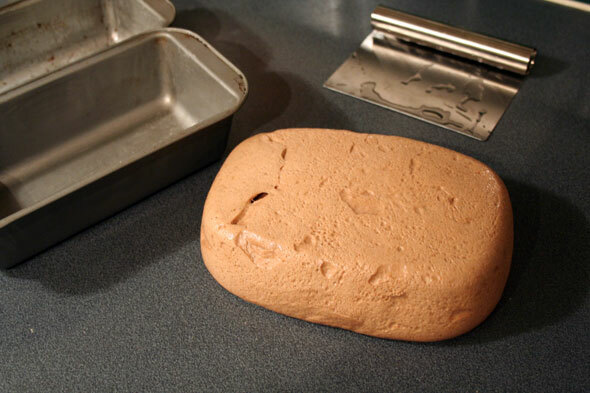 The dough was not very sticky at all, quite easy to handle and hardly any gummy fingers or tacky counter top to worry about. 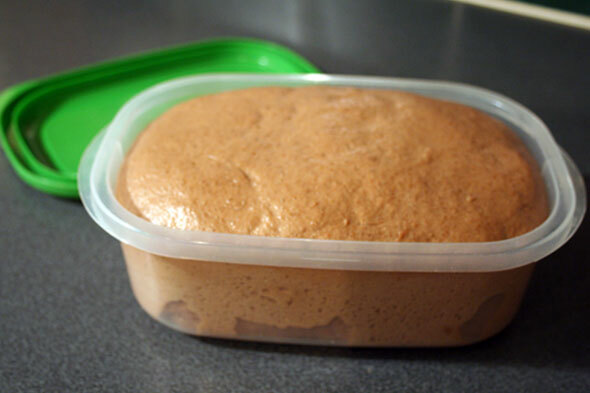 After the six minutes, the dough was smooth and ready. 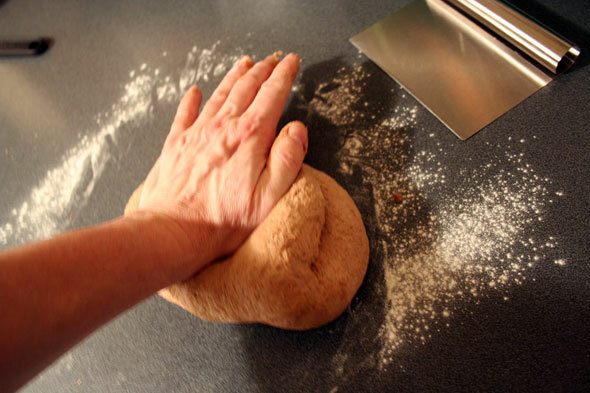 Note to self: Kneading and taking photos at the same time is a little tricky. Check to see if hiring an assistant is in the blogging budget. It’s time for our bulk proofing, so into an oiled bowl the ball o’ dough went. I made sure to also oil the underside of the cover as the dough was pretty much filling the bowl half way already and would otherwise stick to the cover once it had doubled. A bigger container would have avoided this small step of course. After 90 minutes (Reinhart says 90 to 120) we had hit the double point so it was ready to go to the next stage. 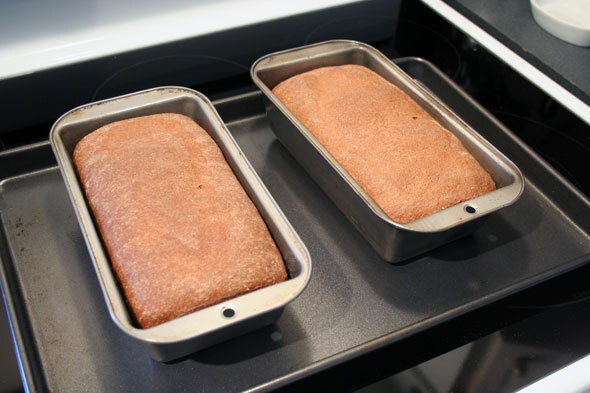 Using a wet bench scraper, I simply split the turned out dough ball in two and with very light shaping, placed the two dough loaves into the lightly oiled pans. These are small bread pans, 8.5 X 4.5 X 2.5 inches tall. I let these do their final proof for another 90 minutes until the centers reached about an inch above the pan’s edge. Since it was now 3 a.m., I popped them into the fridge to continue in the morning. They then sat on the counter for about 1 hour to warm up and maybe get a little bigger. However, they didn’t increase at all while warming. Meanwhile the oven was preheated to 350ºF. Once it had hit that and been left to even out for another 15 minutes, the bread went in as you see here, two bread pans on a baking sheet. They’ll stay in for 20 minutes, get a 180º spin to bake evenly then another 20-30 minutes until they reach 185-195º inside. Here they are after a total of 40 minutes, they had already reached 200º internally. Note that they did not get any oven spring and in fact may have even shrunk a little. Perhaps I should have done a slash but I was a little concerned about the dough before putting it in the oven as I got the inkling they may have been at their proofing max. Slashing them at that point may have deflated them. 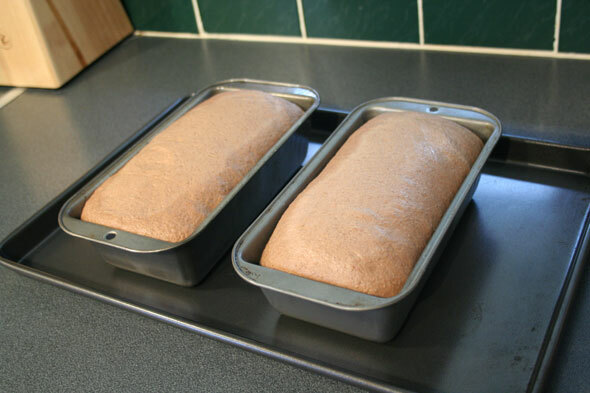 Here are the loaves, de-panned and cooling. They’re rather light, at about 14 oz each. From this angle you can see where the tops were beginning to deflate a little. They smell great, though. An hour of cooling later (Ok, I lie – this was about 35 minutes, couldn’t wait any more) I cut a loaf and checked the crumb. Nice even distribution, small bubble structure, pretty close to the picture in the book and the header at top here. Yes, these are definitely going to be small slices. Flavour-wise, it’s an interesting taste. You can pick up the cocoa, the salt is slightly noticeable but not bad, just definitely present. The rye flavour… Man, again it’s pretty low. Not vanished but a little too subtle for my liking. But then I really like dense, dark, heavy rye and pumpernickel bread that don’t feel ashamed to say that’s what they are. This is a nice bread, overall, even if not what I’d make a point of aiming at. It’s still a little too subtle for me but that may be all that a lot of other people would even want in a pumpernickel. 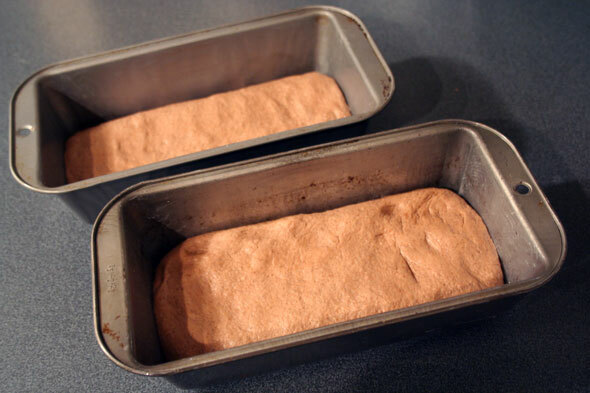 We’re in the process of whipping up some egg salad to make tasty sammidges so I don’t think we’ll have any trouble getting through these two loaves in any case. I just wish this had been a heartier bread. I suppose I’ll have to hop over to the Hamelman book for “serious” pumpernickel. Anne Marie at Rosemary & Garlic very much liked the results. Sally at Bewitching Kitchen loooved it! Oggies at I Can Do that! gave it a “Perfect 5” score. Phyl at Cabbages and Kings found his version dense and “not what I was shooting for”. Seems this one’s a bit all over the map too. If I was rating out of five, I’d give this 3.5: good, not awesome. I really enjoyed it toasted with cream cheese, but the egg salad sounds delicious. Well, I was “promised” egg salad but it never materialized. Somehow that turned into (delish) pork tenderloin instead so I can’t actually complain. The bread went with it nicely anyway! Maybe we’ll see egg salad for lunch tomorrow. I think your loaves look delicious! I love the color! I decided to make free-standing loaves with my dough. Thanks for the heads up on sifting the cocoa powder first. Your bread looks wonderful. I also love pumpernickel that is dense, dark and heavy. Based on your report, that’s not what I’ll get with this one. Home with a sick kid, making egg salad, wish I could have some of your bread. @Anne Marie: I’d be happy to mail you a couple of slices but alas it’s all gone already. @ Jeff: No such critter as a “food co-op” in these parts; the only “Co-op” you’ll run into refers to resident-run housing units. I’ve tried “health food stores” in the area but they’re all fancy schmancy boo-tiques and obnoxiously overpriced. $15 for a pint of malt syrup. FIFTEEN BUCKS!! It’s insanely frustrating not being able to locate this kind of stuff. Maybe I should start up a Canadian home baker’s supply shop. I found your blog a few days ago, and I must say that it is really creative! This bread that you call pumpernickel, is much like what we call “Kubb” in sweden. But we do not bake it in the owen, we boil it in water ..
Pumpernickel, as we know it here, is darker and has hole rye in it .. and no chokolate ..! I just have to buy “The Bread Baker’s Apprentice: Mastering the Art of Extraordinary Bread” It looks really great! Best wishes for your baking! I just found your blog through Susan’s YeastSpotting. Wonderful. 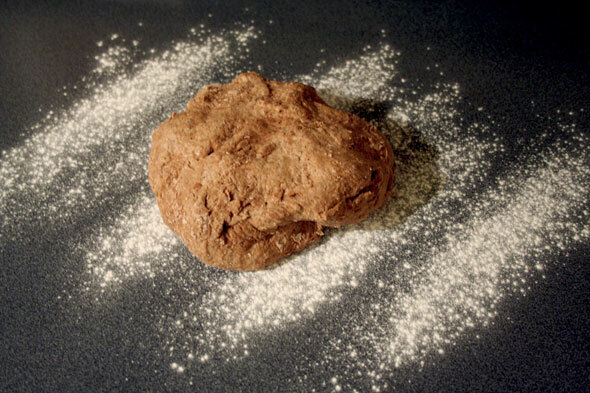 I will be linking you to my blog, you have a nice sourdough site. Thank you for the compliment, Teresa! Now I’m off to visit your site too. This sounds like a very complex tasting bread (in a good way). I plan on cooking my way through the BBA at some time in my life and can’t wait to try this! I really loved the mis en place picture – it’s so pretty ;o). Also, the loaves look nice. 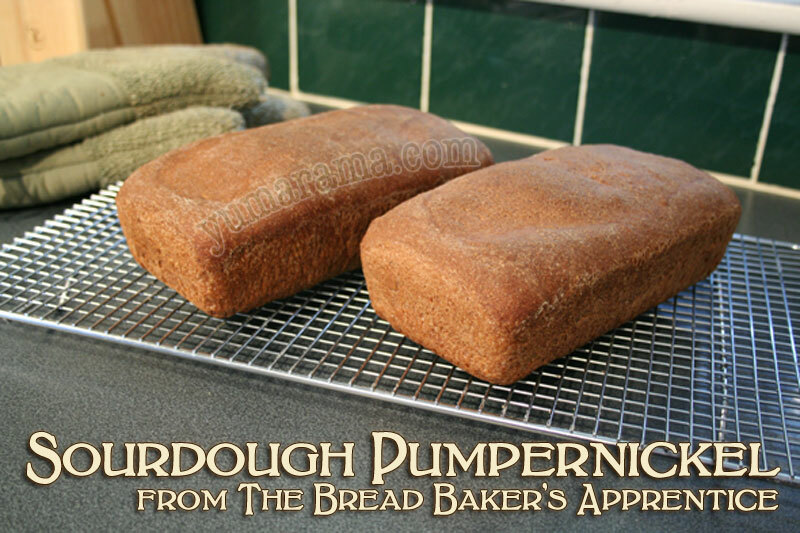 I agree with you that this is not a real pumpernickel, though. 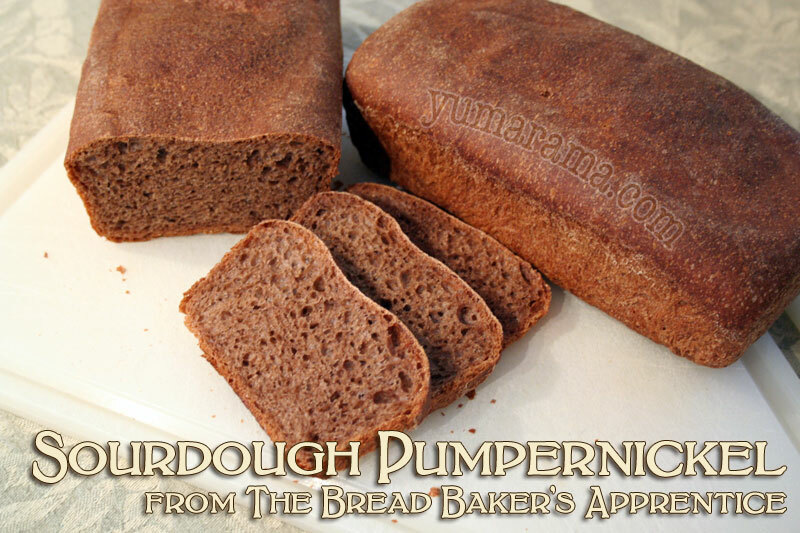 A real pumpernickel is heavy, dense and moist – my BBA pumpernickel was neither of these. Yours is positively fluffy in comparison to mine! I just made this bread, but included the rye bread crumbs from a different hearty rye, and my loaves came out as a hearty pumpernickel.